The University of Evansville is currenlty hosting a five-person review team representing its regional accrediting agency, the Higher Learning Commission (HLC). As you see them around campus, please give them a great UE welcome. If you would like more information about the HLC process and about what to expect from their visit over the next few days, visit www.evansville.edu/hlc and check out the information available there. The Higher Learning Commission (HLC) Peer Review Team begins their on-campus visit today. They will be here conducting interviews and holding open sessions until March 2. Please be sure to welcome the visitors as you see them around campus. Information about the HLC accreditation process, including an overview, the criteria for accreditation and the results of student opinion survey are located under Areas/HLC Accreditation on AceLink. You can also visit www.evansville.edu/hlc. For information about each peer review member, including the ones who will be leading your open session, please visit www.evansville.edu/hlc. A full schedule of all interviews and open sessions is available at www.evansville.edu/hlc. Evie is a yellow Labrador retriever who shares her message to retrieve litter, reduce waste, reuse items, and recycle everything we can in order to protect the earth. Come to see Evie and learn more about UE’s recycling program and the benefits of recycling today from 11:30 a.m.-2:00 p.m., at the Ridgway University Center’s East Terrace lawn. For more information about Evie and UE’s recycling program, check out the Environmental Management Facebook page. All are welcome to join the Newman Club tonight from 5:00-6:30 p.m. for our weekly Monday night Dinner and Discussion. Professor of philosophy and religion James Ware will be there to discuss the topic of marriage in connection with the Bible. We hope that you will join us for this wonderful program! UE Choir Department Give Back Night is today! The UE Choir Department is hosting Give Back Night at Chick-fil-a today. Stop by Chick-fil-a between 6:00 a.m. and 9:00 p.m., and mention the UE Choir Department and help support the choirs and their trip to Carnegie Hall! The Department of Music continues the First Tuesday Concert Series in Neu Chapel tonight, March 1 at 7:30 p.m. with the University Symphony Orchestra’s Spring Concert. Visiting assistant professor and director of orchestral activities Jessica Morel will lead the ensemble in a program of works by Russian composers. Consortium instructor of horn Emily Britton will join the orchestra for a performance of Reinhold Glière’s Concerto for Horn and Orchestra in B-flat Major, Op. 91. The concert will conclude with a performance of Alexander Borodin’s Symphony No. 2 in B Minor. 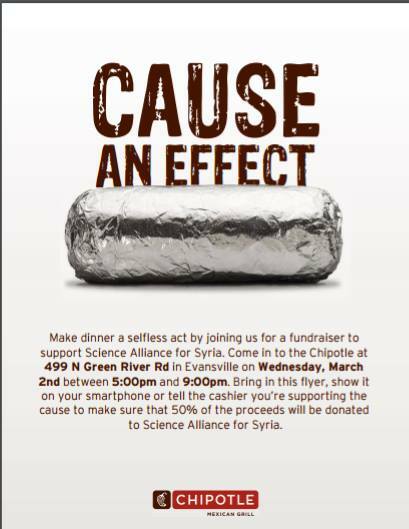 Join Scholars for Syria for “Wired for hate? 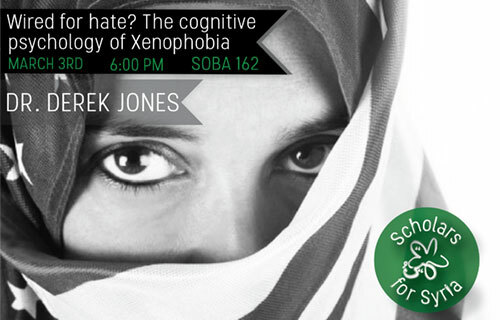 The cognitive psychology of xenophobia,” an engaging lecture by Derek Jones, assistant professor of philosophy, on Thursday, March 3, 6:00 p.m. in Room 162, Schroeder School of Business Building. Jones added that “xenophobia is irrational, and history always judges it so. Why, then, is it so common, and so difficult to detect in oneself? Why are we so resistant to the suggestion that we might be part of the problem? Are xenophobes crazy, or somehow intellectually inferior to the enlightened folk who will attend this talk? I attempt to answer these questions from the perspective of cognitive science. I argue that xenophobic attitudes do not result from defective psychology but rather from the proper functioning of unconscious cognitive mechanisms operating in unusual environmental conditions. I identify these mechanisms and suggest ways to override them. In short, we are all potential xenophobes. The good news is that we may not have to be." Jones received an MA in philosophy from the University of Houston in 2008 and a PhD in philosophy from Indiana University in 2013. He teaches courses in philosophy and cognitive science at UE and directs the Cognitive Science program. He has published and presented work on such topics as scientific explanation, self-knowledge, skilled behavior, and free will. His work is organized around the project of understanding cognition and action as essentially embodied, biological processes. His forthcoming book, The Biological Foundations of Agency, is slated for publication in June 2016. Writing Center Boot Camp: Academic Writing for International Students - Part 2 is planned for today at 5:00 p.m., in the Writing Center. This workshop will address academic writing conventions and tools such as summary, paraphrasing, in-text and reference citation, note-taking, and creating annotated bibliographies. We will also answer grammar questions as requested by students. Join us today for this useful session. The 2016 Spring Healthy Lifestyle Challenge will begin March 14. Please e-mail Ashley Chipps, UE health and wellness coach, at ac375@evansville.edu to sign up. UE assistant professor of physics Angela Reisetter will be the speaker for the Andiron Lecture on March 2. All the lectures in the series are at 4:00 p.m. in Eykamp Hall, Room 252 in Ridgway University Center, preceded by a social hour with beverages at 3:45 p.m. These lectures are free and open to the public. Reisetter's topic will be "The Hunt for Dark Matter." Most of the matter in the universe is mysterious. It is not made up of atoms or of any particle we know. We can see its gravitational effects on stars and galaxies through telescopes, but it is streaming through us at all times, so detecting it in a lab here should be possible. This lecture will describe the international race to discover the characteristics of dark matter, to see it in a lab here on earth. Small signals have shown up in various experiments, but they are not convincing enough to be discoveries. The discovery of dark matter may be just around the corner, or we may never find it. Reisetter will focus on her experiment, SuperCDMS, and our role in the hunt for dark matter. Reisetter has searched for dark matter for 14 years, beginning in graduate school at the University of Minnesota, where she earned her PhD in 2005. She is a particle astrophysicist and uses computer simulations to study particle backgrounds for underground science in general and for dark matter searches in particular. She also authors the Steeped in Science blog and loves talking to curious folks about astronomy and science. The Department of Art is looking for child models for its life drawing class. The children should be in elementary school (kindergarten through fifth grade.) 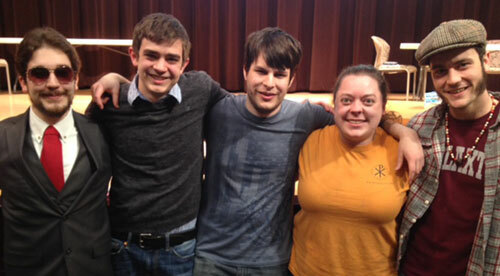 The class meets on Tuesday and Thursday evenings from 6:00 p.m. to 7:45 p.m. in Room 213, Krannert Hall of Fine Arts. You child will earn $10 an hour and the parents of each child will receive the drawings from the session. You are encouraged to bring a portable DVD player, iPad, or book to help you child stay occupied while they sit. For more information – or to register your child - please contact the art department at 812-488-2043 or ca5@evansville. All graduating seniors in good standing are eligible to be considered for the Senior Keynote Address to be given at spring commencement. Please consider submitting a 1000-1500 word speech to the selection committee by March 20. More information can be found here. “The Effect of Ballet Balance Training on Center of Mass Control During Sit to Stand in an Elderly Patient With Balance Impairment: A Case Study" was presented by DPT students Sara Johnson and Amy Gordon with faculty investigators Tzurei Chen, assistant professor of physical therapy, and Janet Szczepanski, assistant professor of physical therapy. "Does the Coordination of Muscle Function between the Agonist and Antagonist Muscles of the Lower Extremity Play a Significant Role when Measuring Muscle Force Steadiness" was presented by DPT student Elizabeth Peterson. 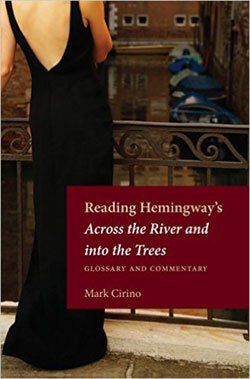 Associate professor of English and Melvin M. Peterson Endowed Chair in Literature Mark Cirino has published a new book, Reading Hemingway’s Across the River and into the Trees, as part of Kent State University Press’s “Reading Hemingway” series. This book is a line-by-line annotation and commentary on Hemingway’s 1950 novel, the first scholarly book ever devoted to Hemingway’s inscrutable and maligned novel. Cirino was a Global Scholar in 2012-13, which allowed him to travel to Venice to research the novel. Several recent UE graduates contributed to the preparation of Cirino’s book as part of ENGL 399, Independent Study in Literature: Jenelle Clausen, Rachel Cochran, Nick Holder, Kevin Kay, Amanda Oaks, Natalie Updike, Samantha Urban, and Susan Vandagriff. For more information on the book, go here and here. Kyle Kiesel, professor and chair of physical therapy, recently conducted a two day workshop for the St. Louis Cardinals sports medicine and performance enhancement staff at their spring training facility in Jupiter, Florida. The workshop was geared at improving communication and teamwork related to injury prevention efforts and a seamless progression from rehabilitation to strength and conditioning. Pregame party set for Friday at 3:30 p.m. In what has become a yearly tradition, the University of Evansville Department of Athletics and the Office of Alumni and Parent Relations have combined to host a Pregame Party in St. Louis as the Purple Aces Men’s Basketball team travels to Arch Madness this week. Evansville enters the tournament as the No. 2 seed and will play the winner of Thursday’s Missouri State/Drake game on Friday at 6:00 p.m. The pregame party will be held in the lobby of Lumiere Place, in downtown St. Louis. Lumiere Place is the team’s hotel. The event is free and will feature appetizers and a cash bar. Door prizes will be given out with the grand prize being four floor seats to an Aces home game next season. Benny’s Flooring is once again the sponsor of the event. Running from 3:30 p.m. until 5:30 p.m. on Friday, the party will give fans the unique opportunity to send the team off as they depart for the game. Those who wish to attend are asked to register here. Parking at the hotel costs $10 and has easy access to Metro Link, which will take you right up to the game. For more information, contact the Office of Alumni and Parent Relations at 812-488-2586. Courtney Land hit her first home run of the season, but the University of Kentucky posted 10 hits as they grabbed a 2-1 win over the University of Evansville softball team on Sunday in the fifth and final game of the Frost Classic. The Wildcats picked up two runs off Aces starter Samantha Fleming in the top of the first. Katie Reed and Abbey Cheek each had RBI knocks in the frame. Two more Wildcat runs crossed the plate in the third as Reed struck again with an RBI triple. UK took a 5-0 lead with a run in the fifth before UE (10-5) got on the board in the bottom of the frame off of Land’s first homer of the season. It was one of four hits the Aces mustered on Sunday. The Wildcats wrapped up the scoring in the sixth as they finished off the 7-1 win. Evansville’s other hits on the day came from Chandra Parr, Hayli Scott, and Kori Keyes. Up next for the Purple Aces is the home opener versus Eastern Illinois on Wednesday, March 9. The Aces and Panthers will play a doubleheader set for a 3:00 p.m. start. One of the best regular seasons in over 20 years saw the University of Evansville Men’s Basketball team finish at 23-8 and 12-6 in the Missouri Valley Conference. With the stellar run, the Purple Aces have officially earned the No. 2 seed for Arch Madness and will play their first game on Friday at 6:00 p.m. against the winner of Thursday’s game between No. 7 Missouri State and tenth seeded Drake. The Aces earned the second seed after earning the tiebreaker over Illinois State. UE finished with an RPI of 91 while the Redbirds were 106th. Wichita State is the top seed and will play the winner of Thursday’s Loyola/Bradley game. Third seeded Illinois State faces the No. 6 seed Indiana State in the 8:30 p.m. game on Friday. The Shockers open Friday’s play at noon. The University of Evansville Women’s Tennis team (2-9, 0-0 MVC) saw their first home action of their spring campaign when they hosted UT Martin and Eastern Illinois on Saturday evening at Tri-State Athletic Club. UT Martin was able to take the first match from the Aces by a score of 5-1. Eastern Illinois then handed the Aces their second loss of the night by a score of 5-0. In the Aces first match against the Skyhawks, Marina Moreno, at flight one singles, was the Aces lone victor. Moreno was able to defeat Hitomi Naito in a highly contested match by a score of 6-2, 6-7, 6-2. Moreno and Doreen Crasta were ahead of Naito and Burcu Tari of UT Martin by a score of 5-3 but were unable to record the victory due to the Skyhawks securing the doubles point. In their second match of the night, the Aces were unfortunately not able to get anything going. The Panthers were able to shut the Aces down taking all of the matches. Three matches went unfinished and one was retired. The Aces will have some down as with their next match comes on March 10 when they travel to Macon, Georgia, to take on Mercer. Their next home match will come on March 13 when they host Southeast Missouri State at Tri-State Athletic Club. In a defensive battle that came down to the final shot, UNI was able to hang on for a 54-52 win over the University of Evansville Men’s Basketball team on Saturday afternoon at the Ford Center. Evansville (23-8, 12-6 MVC) seniors D.J. Balentine, Egidijus Mockevicius, and Adam Wing were honored prior to the game and kept UE in it, scoring 43 of the Aces 52 points. Balentine was the leading scorer in the contest with 19 points, while Mockevicius notched his twenty-sixth double-double of the year with 14 points and 16 rebounds. Wing had a solid day, posting 10. UE has its sights set on the second seed for Arch Madness. The Aces finished the regular season in a tie with Illinois State. After splitting the season series, the tiebreaker will be determined by the RPI, according to the Jim Sukup RPI Report on Sunday morning. UE began the day with an RPI of 81 while Illinois State, who fell to Wichita State on Saturday, was 105. Down as many as 12 points in the second half, UE clawed its way back with a chance to win it on the last shot. A late triple fell short as UNI (19-12, 11-7 MVC) held on for the win. Wes Washpun was the leading scorer for UNI, notching 14 points. Balentine gave the Aces an early 3-0 lead, but UNI came back with a 9-0 stretch. The Panthers hit four out of five shots in the stretch. Jaylon Brown found his groove, scoring four points to lead Evansville back within a point at 13-12, but UNI had the answer once again. UNI reeled off the next 10 points to take their largest lead at 23-12. Balentine ended the drought for UE as they went to the half trailing 25-16. Evansville shot just 29.4% in the first half while turning it over nine times. UNI shot 42.3% in the opening stanza. The Aces scored the first basket of the second half, but a pivotal turning point came just over three minutes in. Egidijus Mockevicius drew a foul, but was called for a technical. UNI converted both free throws and hit a triple when they got the ball back to open up their largest lead at 30-18. At that point, Evansville kicked it into high gear, getting within six at 32-26. A Paul Jesperson triple put UNI back up nine, but the Aces rallied once again. A Balentine free throw made it a one possession game (37-34) with 7:15 left. Just four minutes later, Wing hit a huge triple that got the Aces within a pair at 49-47. His second trey of the day in the final minute would cut the UNI lead to 51-50. The Panthers were able to respond every time, but a missed free throw with 13 seconds remaining gave the Aces the ball trailing by just two. Out of a time out, Balentine had a 3-pointer blocked by UNI. He was able to get the rebound and find Mislav Brzoja, whose triple at the buzzer came up just short.